I received a private email from one of our website visitors about the death of one of her pack members that about broke my heart. The fact that her dog passed away is heartbreaking enough for a pet lover, but the visual I got when I read the circumstances surrounding her dog’s death are very disturbing for me. Natasha and her family shared their home with four dogs until tragedy struck. Unknown to them, the previous owner of the house this family had recently moved into had set rat poison under the house which unfortunately, their dogs got into. 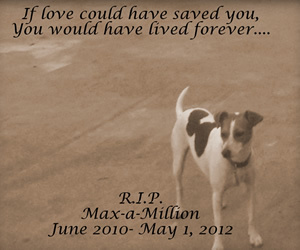 From what I know of rat poison, Max suffered an extremely painful death. It was Natasha’s tireless determination to find out the cause of her dog’s illness and caused Max’s death that led to the discovery of the rat poison. When they found their dogs were ill they took them to the vet and did everything they could to save them. It’s all too often I hear of people just putting their dog down when they are facing expensive vet bills that could save their pet’s life and so it’s a heartwarming surprise when I hear of a family who spared no expense to save their poisoned furkids. Unless their vet is a family friend or relative who provided them with free vet services, it sounds like they spent a fortune trying to save them. The family’s quick action, willingness and ability to pay for whatever was needed for their furkids, the skills of what must be a very good vet and the determination of their Mom allowed them to amazingly save all but one who didn’t make it. Max, may you rest peacefully and pain-free at Rainbow Bridge. You’re a very special boy and your family misses you terribly. Those of us here at Riley’s Place would like to thank you personally for helping your pack member Jesse to overcome her issues and become a treasured family member. Natasha told me how her 87 year old Father had first rescued Jesse as a young pup about to be put down because the breeder considered her un-trainable?????? There pretty much is no such thing as an un-trainable dog and in most cases where someone thinks a dog’s a lost cause, the right owner can turn this around. Due to health issues Natasha’s Father couldn’t keep and properly care for Jesse and so Natasha and her family stepped in and took Jesse to live with them (thank you!). It sounds like initially Jesse was quite fearful and insecure, spending a great deal of her time crying and pacing. With Max’s help and the family’s dedication, Jesse soon became a well-behaved, trained (imagine that!) and loved member of the family. She became quite attached to Natasha and her husband and they believe Jesse loves their toddler aged son but to me it does sound like Jesse prefers adult companionship. The reason Natasha contacted me was actually her concern over the change in behavior that Jesse is now displaying which include barking at people she doesn’t know (again). I take this to mean that she had gotten over a fear of strangers which had caused her to bark at them but she learned to trust more and stopped but has now regressed to her previous behavior. An unexpected incident occurred one day when Natasha’s husband was playing ball with a friend’s son. Their son walked up to his Daddy and Jesse pushed him down with her nose. Natasha tells me that Jesse’s behavior reminds her of jealousy and sibling rivalry. Jesse is almost always in the company of Natasha and her husband and according to Natasha gets plenty of stimulation. Jesse and Max used to sleep in their sun room together but after Max’s death they brought Jesse to sleep in their bedroom. I do feel that at least some dogs grieve the death of pack members and that like people will deal with grief in their own way and in their own time. Because it seems that Jesse prefers adults as company makes a good case for believing that Jesse is looking for a pack leader and it makes perfect sense that she would turn to the adults in the home to fill this role. Not being a trained/certified expert in dog behavior I also consulted with some other experienced German Shepherd owners who’ve gone through the death of a pack member in order to get some feedback to give Natasha. Up the NILIF (if you practice this) in a kind way. Spend some special time working on obedience in an upbeat way to reinforce the human leadership role. 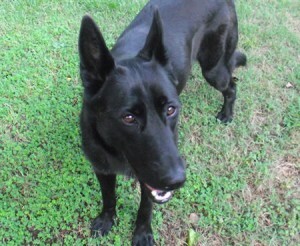 She may need some reassurance and to find a new way/other pack member/person to bond with in a different way. Find new patterns that involve the human(s) and the dog working as a team, showing her that now there’s a new pack. Although you say she gets plenty of stimulation, perhaps changing the stimulus to new interests may help get her mind moving away from grief. If you don’t currently participate and can afford to you might look into structured dog activities such as rally, obedience, agility or tracking for example. Some of these are very inexpensive, so you don’t have to break the bank to participate. I read somewhere that dogs who sleep in our beds may be more likely to display resource guarding behavior. (More on resource guarding below.) You might want to have Jesse sleep with the other dogs in the sun room which was her “norm” before Max passed … putting some “familiars” back in her life might help her deal with things. Although Jesse’s current behavior resembles sibling rivalry or jealousy it also suggests Jesse is displaying a behavior known as “resource guarding.” Jesse is very attached to Natasha and her husband and so pushing the little guy down *may* have happened no matter what. Max’s death may have little or even nothing to do with it. It sounds like their little boy stepped in between Dad and Jesse and Jesse feels Dad is “hers” and doesn’t like anyone getting between her and “her property.” Since that’s the only issue with the child that Natasha shared with me it’s hard to tell without more information on Jesse’s interaction with the little guy both before and after Max’s death. Resource guarding (RG) is when a dog has possession of an object that HE thinks is valuable, and is growling/snapping/biting in an effort to protect/keep that object. This link will take you to a post on this topic at dogforum.com in case you want to read more on what they have to say. Dogs may guard food, bowls (even when empty), bones, toys, and locations (such as their bed, your bed, a favorite piece of furniture or a location in the house). Dogs may also guard seemingly unimportant items such as tissue, pens, shoes or other such items they may steal or find on the floor. Dogs may even guard people. This link will take you to an article at lindabrodzik.com in case you want to read more on what she has to say. It was suggested that Natasha read the book “Mine” A Practical Guide to Resource Guarding in Dogs written by Jean Donaldson. I’ll also be reading it very soon! The link directs you to the book at Amazon.com. If I understood Natasha correctly, Jesse is currently about 7 months old and so still very much a pup. In my opinion whatever they are it’s imperative to get Jesse’s issues under control, especially because there’s a child in the home. If it’s resource guarding it can become dangerous in a heartbeat and without any warning. I hope you will follow the suggestion to never ever leave a child unattended with any dog (I’ve read about a Pomeranian killing an infant!). This would be particularly important with a dog that could be displaying resource guarding behavior. Natasha, to your credit you didn’t quit until you found the cause of Max’s death and I’ll bet you won’t stop until you find out for sure what Jesse’s issues are and turn her negative behaviors around. We’re rooting for you! 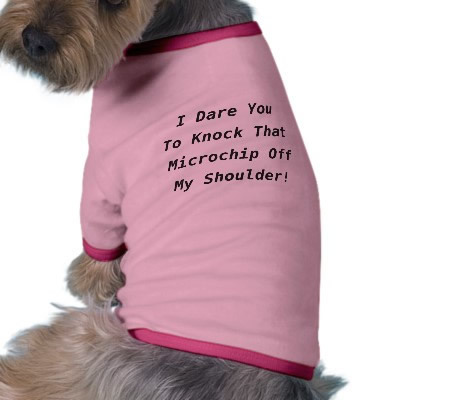 You might want to locate a good dog behaviorist in your area and get some help. I would be curious to know if a respectable dog behaviorist agrees with what we think is probably going on with Jesse. We hope that this helps you, Natasha, and anyone else experiencing this kind of behavior in their dog. I hope you will keep in touch here on our blog and let us know how it goes. Best of luck! Do you have a thought or suggestion about Jesse’s behavior for Natasha? I’m new to learning about resource guarding myself. The links given in this post are not to be taken in any way as endorsements of any kind. It’s also important that readers understand that given the information we have, we can only make an educated guess regarding Jesse’s behaviors. We are not diagnosing Jesse and providing a cure nor are we responsible for any resulting issues dog owners may experience by following any suggestions found here. that is crazy… try getting a soil test from a few different locations specifically looking for poisons of any type. I assume that should be reasonable and not cost a lot. at this point – sell your house and move on. Its not worth the hassle and risk… once you find out the problem then the real cost would start trying to fix it. Thanks for sharing your ideas, John. A horticulturist contacted me back and we are setting up a meeting for her to walk the backyard. We just want to be sure to rule at plants, since I’m not an expert. I also contacted a Pest Control company and told the manager what was going on. He is going to talk to the trainers (specialize in chemicals) and see if they will come walk the backyard. My thoughts last night were about security cameras, so thank you for the links. That saves me some time & I have feel time is very important right now. I think I will go ahead and write the newspaper also. At the very least it will bring animal lovers together & it seems that other animal lovers are the only ones who truely feel my pain right now. I will say that I have hit a lot of brick walls in this state. It’s disappointing, but on my list of “things to change” once this situation is over. 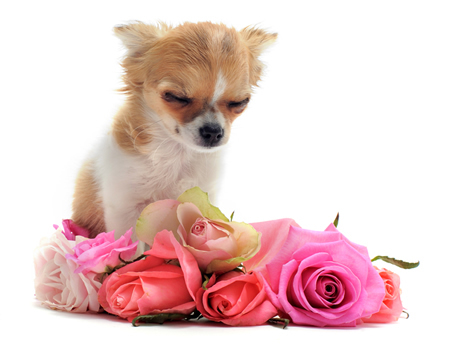 A pet owner should not have this many problems finding help. These are not “just dogs” and it’s well past due for Americans to start showing some respect for other life. I’m in my senior year of college and I’m a psychology major. We are trained specifically that one of the telltale signs of psychopath behavior is doing harm to animals. So, perhaps if these things were given the attention they deserve, then maybe we could catch human killers before they actually kill. But, I’m seriously starting to think I picked the wrong major. I am far more fond of these animals then I am of humans, at this point. Animals love unconditionally, humans could take a lesson from that. Anyways, thank you so much for showing Max respect. Thank you for all of the advice on my Jesse Girl and thank you for showing concern for what my family is experiencing. I will keep you updated. I had wrote you once about what was happening in my backyard. About my girl, Jesse, getting into whatever the other pups had and us being able to save her. We thought it was rat poison and it has not occurred again since 2012 until now…. I am writing to update you that it happened again and this time it killed my girl. I have been devastated by this and have tried to get help everywhere. Please share my story because I am completely out of options. We had been throwing the pack outside again. It had been over a year and a half since any situations happen… I will never forgive myself. December 7, 2013 was our son’s third birthday. I had been out of town for a week with my sick grandfather [the one who gave us Jesse], but I drove all night to be there for my son’s birthday. It had been raining for about four days and was still very damp outside. That morning Jesse let me know she had to potty so I put them all out in the backyard, which wasn’t unusual by this time. I observed the dogs playing outside (nothing unusual). I went upstairs to change my son’s clothes and peeped out his window at them again; I’ve been so cautious [to the point where my husband and friends have told me I need to relax a little] because it always stayed in the back of my mind that we never found out for sure what our dogs had gotten into [through testing]. Jesse and Sammy were in the back of the yard, on the left hand side, against the fence (opposite side of the yard where all the other situations occurred). My son and I finished getting ready upstairs (about 30 minutes) and walked downstairs. I heard Sammy whining, so I took a peek outside; our nightmare was beginning all over again. Jesse was in the grass close to our deck when I checked on them from downstairs. She was drooling excessively; it looked like it was thick drool because it went from her mouth almost all the way to the grass and it looked like grass was in the drool. Upon observation she started having head spasms and I knew immediately that I didn’t have a lot of time. I called my husband to come home immediately. All I had to say was “Max symptoms” and he didn’t even say bye. He just hung up and tried to get home as quick as he could. Jesse went from a sitting position to a sawhorse position, fell over on her side, and started seizing. Since it was just me and my three year old I didn’t feel like I could pick her up or put her in the car with my son. So, I literally just watched her from my window and cried. I pulled the other two dogs in and checked them over; they weren’t showing any Max symptoms. About twenty minutes passed before my husband was able to get home. When he got home she was in a seizure state without any time passing between seizures similar to Max. Her pupils were contracted. We put a blanket over the top part of her body to try to get her to calm down. My husband tried to keep her cool (because seizures can make a dog’s temper rise very quickly), but she just wouldn’t stop seizing. It was like she was fighting it and then just gave up. We called the emergency vet again; again we were told that we could try to bring her in for fluids and medications to try to control the tremors/spasms/seizures, but based on what we were telling them they felt like she was too far gone. So, once again, we had to make the choice to put our fur-baby down. I cannot begin to explain the emotions that we have experienced. I have done nothing but research and search for the source of this since December 7th. Once again, no vomit; no dig marks anywhere; nothing chewed on; just nothing. It’s maddening. We had a necropsy done by the emergency clinic Vet (because it was a weekend) and she said she didn’t find anything physically wrong with her and there wasn’t anything but dog food in her stomach. We requested a toxin report. When the toxin report came in my regular Vet explained to me (over the phone) that the pathologist couldn’t do it because Jesse’s samples were put in formaldehyde. The Veterinarian that performed the necropsy literally corrupted Jesse’s samples losing all chances of finding (or ruling out) whatever toxin has been the cause of all this death. No fur-baby or human (except me and my husband) have been allowed in our backyard; it’s completely quarantined. I have called everyone down here that I can think of: the extension office, the poison control, animal control, the police department, the local humane society, four different Vets (that messed up every chance we had to test for toxins), six different mycologists (because I found wild mushrooms growing in our yard), exterminators, and nobody can/will help me. It’s has got to the point I know how people will respond to this because everyone [and I do mean everyone] says the same things. “I’ve never heard of that; that sounds like a chemical; are you sure nobody is poisoning your animals?” I’ve never seen anything like it in my life and I was raised on a farm in Alabama; I know it sounds some type of chemical, but I have yet to find one; and, there is so my debris around my yard that someone would have to have a substantial amount of hate for us to try to poison our dogs. Let me also mention that our neighbors dog barks all the time and constantly gets out, yet he is still alive, while my babies are gone. I have walked my backyard too many times to count. I have spent countless hours researching what can do this to a dog. I cry every day that I cannot figure out what is going on in our backyard. We are literally discussing selling our house, but how could we, in good conscious, sell this home to another family with animals? ANY help, any story, any new suggestions would be greatly appreciated. I am out of ideas. I am out of people to contact in my local area. I do not know what to do other than communicate to the animal communities directly and ask- has anyone been through this or heard of this? Resource guarding actually makes a lot of sense. When she first came to us she was like that with her food bowl. She would growl at the other pups if they came close to her bowl. So, I would switch the bowls every night. I wouldn’t give her a special bowl and I would pet her while she ate. It didn’t take long to break her of that bad habit, although I’ve heard her grumble at my chi-chi (Roxy, the oldest of my babies, 8), but my chi-chi grumbles back at her. My Gram’s used to tell me she is a “one man dog” because she got so attached to my Pop. But, I think he was just the first one to show her love. She wouldn’t let me or my husband touch her when we first met her. And she would run from our son. I would laugh at her and tell her the baby wasn’t going to hurt her. She let my husband touch her first, then me, and finally our son. We are always safe and we never leave our son alone with her. I don’t want to set her up just to fail, especially since he’s very active these days. My son and I have been taking her for walks around our neighborhood. Trying to get her out of the house and around more people. I do think a big part of this regression in behavior is depression. I’m sure it doesn’t help seeing Momma still cry over our Max. Either way, we are in this together cause that what family is all about. I also wanted to give you an update: Unfortunately, it is not good news. We had another episode in our backyard. My mother found an abused pup and brought him to us (knowing I can’t say no to sad, beautiful brown eyes). We had fenced the bottom of our deck just to make sure none of the animal kids could get under there. We didn’t want to risk losing another one and with the amount of rat bait we found, I didn’t want them digging around the crawl space. Everything was going good, although Jesse girl didn’t much care for the pup. But, Oscar fell in love. They had been outside for about a hour, which was the longest amount of time since our horrible experiences began. My husband went outside and then he found our Buddy (the new pup). Words can’t even begin to explain what we witnessed in Buddy. He was well beyond the point Max had been and I called the emergency Vet. There was nothing we could do, but take his pain away. I had a pretty big argument with the Vet and am currently searching for a new one. I was asking her about blood tests or what we could do to find out what these babies are getting into. She commented that she was suspcious of strychnine poisoning ever since she saw Max, but didn’t want to say anything because she couldn’t guarantee that’s what it was. I just lost it… which is very rare for me. But, given this is the fourth soul to experience this and the second to die, I am seriously stressed out. I’ve never seen anything like this in my life. Oh, and she told me there is no where to report a possible dog poisoning and no test to determine if its strychnine. I am beyond myself at this point. I am starting to believe that this is a malicious act. This happened last Thursday and we can’t find anything. There is nothing chewed on, there is no change in behavior before this happens, and our backyard isn’t easy to access… Honestly, after a lot of research over this past weekend, I seriously think it might be strychnine poisoning. The onset of symptoms is quick and stimulation makes it worse. The seizures start out one right after another, then there is no break in between. At the moment all of our animals and our son isn’t allowed in the backyard. I just don’t know what else to do. I don’t know who to contact and we have nearly depleted our funds due to the Vet bills. Does anyone have any idea on what to do? And, perhaps… maybe that is why our Jesse girl has been behaving in this protective manner. I live in the state of Georgia and if ANYONE can help me, then please contact me!!! I’m desperate at this point. I think it was very wrong of the vet to not tell you what she suspected. At least if she had shared with you what she thought was even a possible cause you could have researched it. She could have prefaced her suspicions with something like “This is just a suspicion, only a possibility. I have nothing concrete to support it but I’m thinking it might be … blah blah blah.” Or “Some of the symptoms remind me of …. ” You get where I’m going with this I’m sure. It doesn’t sound like you have lived there long enough to make any neighbor-enemies so my first thought is if it is being done intentionally, it’s by an animal/dog hater. I’m not suggesting you go door to door asking questions because you could unknowingly be talking to the guilty party. Four places I would go to would be the local Police Department, the county Sheriff’s Department, the local Health Department and the library and/or newspaper. Any of these may have records of other instances of this that might shed some light or perhaps if there are, the Police/Sheriff would have more info from you to investigate further (if they are at all). If they’re not already they might even start an investigation. I’ve heard that the state of Georgia is one of the worst states, if not the worst state for helping with anything having to do with dogs, so you may hit a brick wall. If they have previous reports they may also have a suspect. I would think the Health Department would be very interested in what’s happened even though it’s dogs that are being affected. Strychnine in someone’s yard from an unknown origin seems to me would definitely be a potential hazard to people as well. Rain could wash residue to adjoining properties for example, get into the water supply, mice could be dragging it into the yard from under the house and on and on. At any rate it sounds like not only your dogs are in danger, but you and your family may be as well. The newspaper might be interested in doing a story to get the word out or be aware of other instances. Searching issues of newspapers for like incidents in the area might also be helpful. One more place I would go would be local and surrounding county humane societies and animal shelters. They also might have information on previous incidents, might have a suspicion of who might be doing this. These websites change their products every day at midnight and I’ve often seen them sell security/monitoring camera setups with multiple cameras for like $199.00 including the software to set up on your computer and some may even have an app for a smartphone that you could monitor when you’re away from home. You could also check Amazon http://www.amazon.com and eBay http://www.ebay.com. I would try to get a system that offers zoom capability so if you do see someone out there you can get a better look at them. I’d hide the cameras, positioning them to monitor the entire yard and as far around the surrounding area as possible because the person might be tossing the strychnine from a distance so as not to be seen. Since anyone is suspect, I wouldn’t share that I’d set up cameras. I found this link: http://www.petplace.com/dogs/strychnine-poisoning-in-dogs/page1.aspx but you probably have already read it. Since the previous owner admitted to having put rat poison under the house, residue could potentially be polluting the yard. The article says that “Toxicity can also occur from the ingestion of poisoned rodents and birds.” This brings up the possibility that someone is using it elsewhere and it’s inadvertently winding up in your yard. Does anyone else have any ideas or suggestions for Natasha?